Think the Philippines is small? Think again. 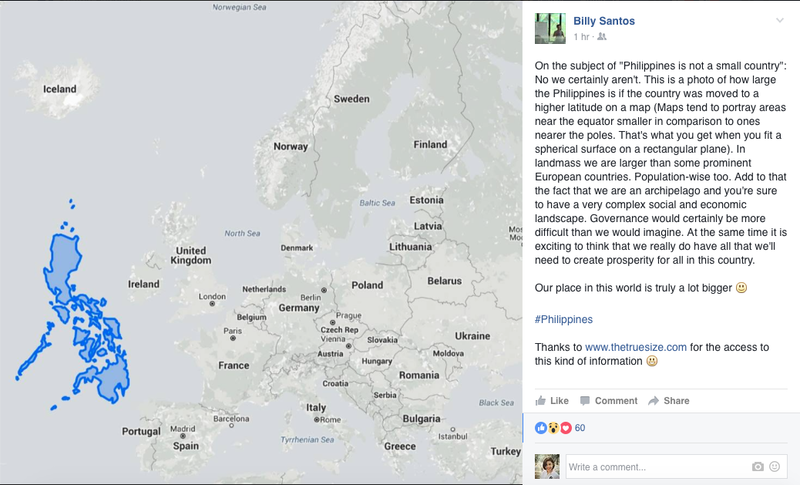 On the subject of “Philippines is not a small country”: No we certainly aren’t. This is a photo of how large the Philippines is if the country was moved to a higher latitude on a map (Maps tend to portray areas near the equator smaller in comparison to ones nearer the poles. That’s what you get when you fit a spherical surface on a rectangular plane). In landmass we are larger than some prominentEuropean countries. Population-wise too. Add to that the fact that we are an archipelago and you’re sure to have a very complex social and economic landscape. Governance would certainly be more difficult than we would imagine. At the same time it is exciting to think that we really do have all that we’ll need to create prosperity for all in this country.